In a typical year, I get about 2 to 3 colds and the flu at least once. Some years are definitely worse than others. Earlier this year, I was hit with the flu that was the worst one I think I’ve ever had. It lasted about a week and I was sick with a fever that seemed to never break. I had a hard time doing anything. Even getting on the computer to check emails was difficult because my whole body hurt. Then there’s the hot flashes and cold sweats. Fun stuff right? Health Canada says that in a typical year up to an estimated 25% of Canadians come down with the seasonal flu. That’s 8.6 million people! I know there’s things you can do to try and decrease your chances to get sick like frequent handwashing and avoiding close contact with people you know are sick. Getting plenty of rest helps too. Another option to consider is getting a flu shot. I’ve ever had one flu shot in the past and that was when we were still living in Alberta and it was offered to us for free. After we moved around a few times (Ontario & Nova Scotia), I didn’t even think to get another. I didn’t have a family doctor and didn’t know where I could get one. I recently just discovered that Shoppers Drug Mart offers flu shots by their certified Pharmacists! You can book your appointment online or walk-in to your local store and ask for one at the Pharmacy Counter. Shoppers Drug Mart also has information on their website about how to prepare for cold & flu season including some must-have products to have on hand at home when it strikes. I need to go shopping and pick up a few more items on their list of recommended products! If you are interested in getting a flu shot, visit Shoppers Drug Mart to find the closest location to you that offers them. I’m considering getting one this year once they are available in my area. I remember what I went through last year and DO NOT want to go through that again! I learned that I can get the flu shot at the Shoppers just down the street from my house. I learned u can get ur flu shots there. I learned that, for most people, the flu will last 1 or 2 weeks. I always hear about that “24 hr bug” or “48hr bug” so it makes me wonder if we are just in denial about being sick the rest of the days. I had no idea you can get you flu shot there, that’s wonderful! I learnt that Shoppers Drug Mart has a “Decongestant Nasal Spray with moisturizers”!! This would be very much appreciated in my home during flu season..
Sterline saline nasal mist would be handy…. I learned: That I can get my flu shot at Shoppers Pharmacy instead of having to go to my doctor’s! I learned that we should store drugs according to instructions, ensure they are not outdated & take our expired medications to Shoppers Drug Mart for proper disposal. I learned that you can get a flu shot from a pharmacist at Shopper Drug Mart. Learned that a humidifier can help soothe a cold. That flu shots can be administered by the pharmacists. 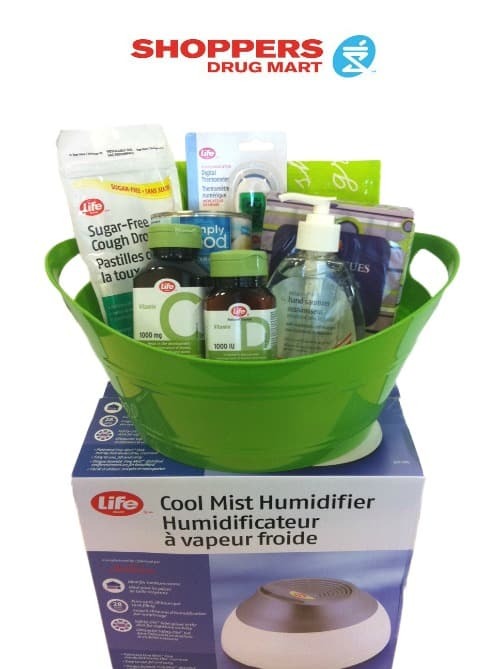 I would love to win this wonderful basketful of cold and flu remedies..I learned that you can get the flu shot at Shopper’s Drug Mart. Wow! I did not know you could get a flu shot at Shoppers Drug Mart, I am going to do that this year! Thanks for the info! I learned that I can get the flu shot right at my Shoppers drug mart! good to know you can get a flu [email protected]! I learned that Shoppers Drug Mart gives out flu shots. I learned I can have a flu shot at Shoppers! Cool!